The Alameda was a long tree-lined avenue, leading north from the formal gardens of the Panama-California Exposition's Southern California Counties Building, providing access to the numerous agricultural-related displays situated along its length. The curving avenue contained benches for seating, allowing exposition visitors to enjoy the temperate climate of Southern California while viewing the many outdoor exhibits. At the Alameda's south end was the large and commodious Cristobal Café, operated by Levy's Restaurant, where many official banquets took place during the course of the exposition. 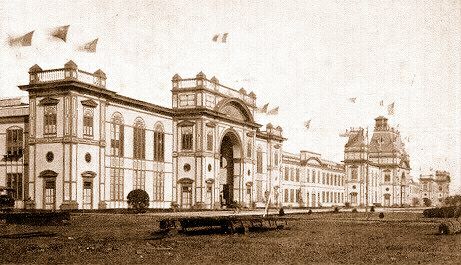 Located immediately north of the Cristobal Café was the exposition Fire Station, housing a trained crew of fire-fighters and the most modern fire-fighting equipment. 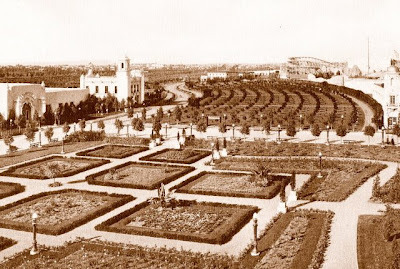 The spacious Southern California model farm and citrus grove covered the area north and east of the Fire Station, and were neighbored on their north side by the International Harvester Company Building and tractor demonstration field, and the Lipton Tea Pavilion and Gardens. The Nevada State Building, Standard Oil Company Building, Open-Air Theatre, and Tractor Exhibit Building were situated along the remainder of the Alameda, which extended to the exposition's north entrance.